„It was extremely stressful out there. The wind was shiftier than the first two days,“ said Adam Minoprio, helm of SAP Extreme Sailing Team. „At one point we were last at the first mark and then we managed to be first at the bottom. Then in the last race, the opposite. „It was incredibly stressful for us sailing and I’m sure it was stressful for everyone watching, but I’m very, very pleased to come away with a win,“ added Minoprio. „Barcelona is another race and a new story, and we’re really looking forward to that,“ added Psarofaghis, whose team will compete alongside the rest of the fleet in Act 4, Barcelona, in less than three weeks. 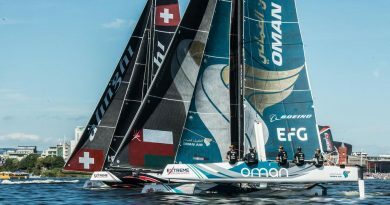 „The three of us; SAP Extreme Sailing Team, Alinghi and our team were very, very tight, and were exchanging blows left, right and centre, and sometimes it wasn’t paying off,“ said Pete Greenhalgh, mainsail trimmer for the Omani squad. „You’re trying to slow someone down a little bit and hurt them and end up really hurting yourself, so we didn’t quite get it right on a few occasions. „We definitely wanted to win the event and finishing third is a disappointment, but the reality is that we weren’t good enough to win. The fact that we were nicely in the mix we are happy with. I feel like our game has moved on but we’ve still got a bit to go,“ Greenhalgh added. 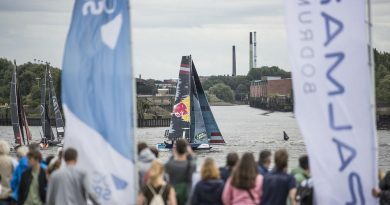 „Definitely up and down with emotions,“ said Red Bull Sailing Team skipper Roman Hagara, whose shore crew finished repairs to the damaged boat just in time for it to be launched for racing this afternoon. 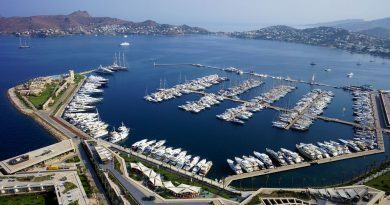 „Yesterday we had the capsize when the rudder came off, and then today not much time to sail before the racing started. In the end it worked out well. We had two race wins and won the final race. It was a good finish,“ added Hagara. 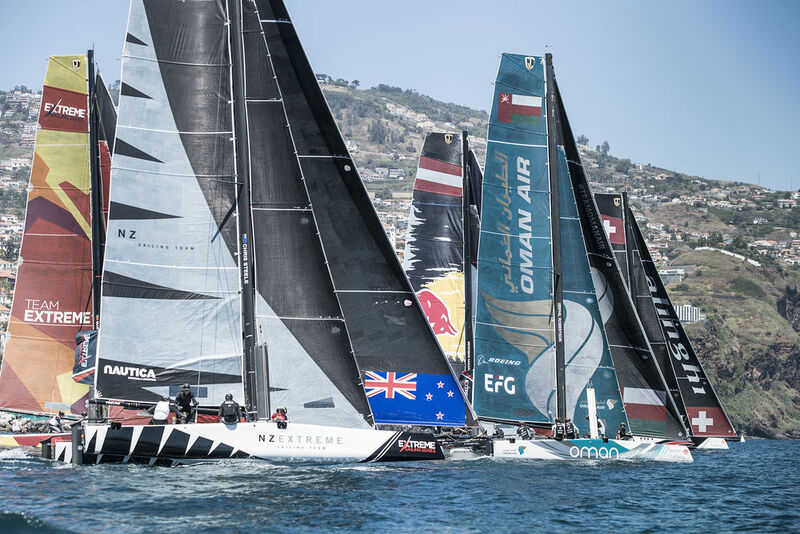 The event also marks an achievement for the Extreme Sailing Series, which was awarded the Gold certification by the Sailors for the Sea in its Clean Regatta programme, achieved by introducing a number of sustainable practices to reduce the environmental impact of the event. 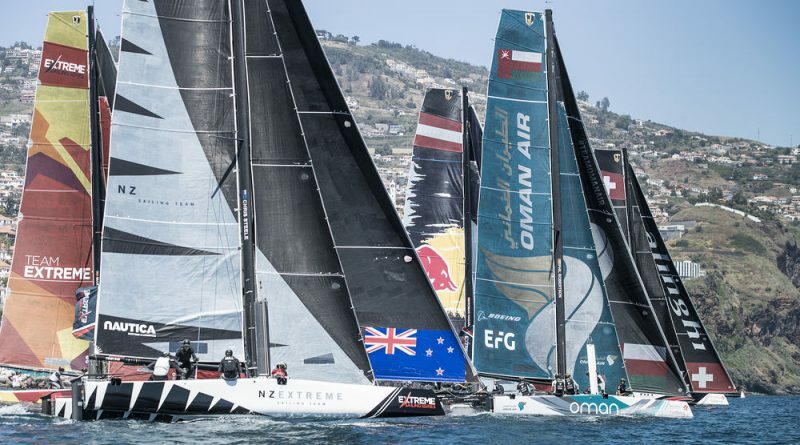 NZ Extreme Sailing Team was awarded the ‚Green Team‘ trophy.